This one will have a jute clothesline and mini clothespins. I made the quilt an actual mini with a back. The pieced background sure makes this row sing! The only thing this row is missing is the Elvis wedding chapel. This row just makes me laugh! we really don't have martians overhead! I found a piece of snow dye fabric, that reminded me of a sunrise sky. Perfect for a balloon experience! Loved the piecing on this row! So many different quilting techniques in this row. Great way to play! You will see more of them pop up here, from time to time. Looking forward to what you have in store next year. it was a great Row by Row - love all the creative inputs!!! All your rows are beautiful. Awesome rows!!! So much creativity in the designs as well as the fabrics used!! I need to go on a row hop!!!!! Wow you've done a lot! It's fun to see the different combos of rows. I loved the row along. Such talent and inspiration. Thank you for being a contributor. Wow. You have made a lot of the rows, and done a great job. I have managed the outer space row so far and that is it. My next row (eventually) will be the hot air balloon one. So many ways to individualize that row. What fun, thanks for all your work! Fun seeing all the different rows. Wow, all these rows are fabulous. Really like the New Mexico Hot Air Balloon festival with that morning sky and your textured hills. Joan I love all the rows you made, including my balloon row! So fun to see how it looks when someone else makes it. Love the sky fabric you used. You picked some great rows to sew! I saw the drive through Elvis wedding chapel the other day when I was downtown in Vegas. Cracks me up! Wow! So many beautiful blocks. Love how you made them your own, and that background fabric behind the hot air balloons is breathtaking! 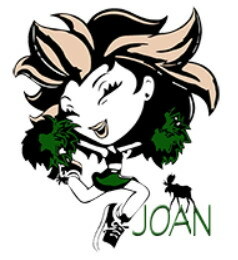 Awesome Joan! They all look fantastic. You've got a lot done! I'm still finishing my row. Loved them all! Nice job...wished I was further along! This has been a fun bloghop! Thanks! Wonderful job with each of these rows! It will be fun to see it all come together. You've made so many of my favorites! Great job on your fabric collections. I'm in love with your very first row. Great job with the rows, you picked some good ones. Wow, these rows are just wonderful! You make so many wonderful quilty things, I figure you never sleep! I had a great time visiting all the sites and learning about other places. Thank you all for the great patterns! Your fabrics for each row are just wonderful-they all turned out just great! You have been busy! These rows we have collected all have so many possibilities of things to make! Thank you. The creativity of the row makers is astounding. Thanks for the fabulous hop. Your rows look amazing. I know you don't sleep but how did you get so many done? And how many are there to go. Wonderful work!!! I love them all! This is been a delightful blog hop, and I grateful to you and the other participants for sharing all your talent! The hot air balloon row is one of my favorites! The background fabric is perfect for it! Wow, I love the snow dyed fabric and all of your rows. Thanks for sharing your talents. Loved all the rows and learning more about people and places here and far away.